Did you know that “Grit” is one of the hottest concepts in psychology? Angela Duckworth says, “Grit is living life like it’s a marathon, not a sprint”, and I can definitely attest to that. I cannot believe it has been more than 12 years since I started my training company. The journey from then to now has been filled with hardships and many ups and downs, but also a lot of self-satisfaction and fun. I have learned that in order to get what you want you have to know what you want, and you have to have something that certainly isn’t taught at school. It’s called grit. 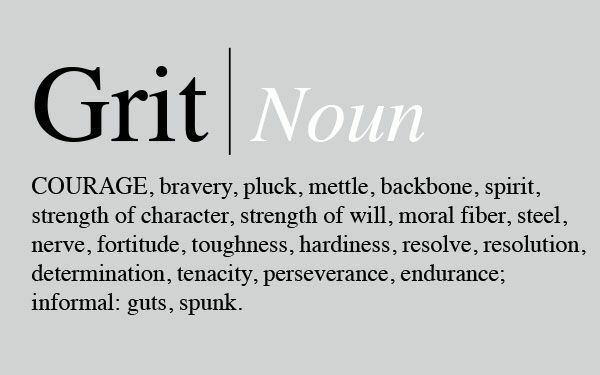 Grit is defined as perseverance and passion for long-term goals, and without it you probably won’t get very far. My passion for the people in the manufacturing industry has been my fuel over the years, and my vision of what can be has helped me to persevere. In the early years of my entrepreneurship and during the Great Recession in 2008 my business associate Heidi Garcia and I each cold called about 130 companies a week. This meant calling between 25 and 30 companies a day and hearing the words, “No, thank you”, “Not now”, “Call me again next week/month/year” or “We just laid off people and can’t invest in training” over and over again. We became pretty resilient in hearing the word “no” and overcoming rejection. However, I do believe amazing things happen when you are discouraged but keep giving your best anyway. We kept going until we got business from a company that manufactures toilet paper. Toilet Paper! This is certainly recession proof. Nobody can save money by refusing to purchase toilet paper, right? Thinking about it, during a recession people need even more of it. I will never forget that it was toilet paper and our unbreakable spirit that saved Karico. I encourage you to be persistent and patient, think positive thoughts, build meaningful relationships and develop grit. Every no today can be a yes tomorrow. Every try can be converted into a win and every problem can be turned into an opportunity. You have to decide how much you want it. Nothing comes easy, you gotta work for it. Surround yourself with good people and get down to the nitty-gritty.